The Grand Hotel Ortigia is surrounded by the deep blue Mediterranean sea, a stone�s throw from the Fonte Aretusa (..where it is said that the Goddess Diana saved the young Aretusa, by turning her into a well, from the advances of the God Alfeo ...). 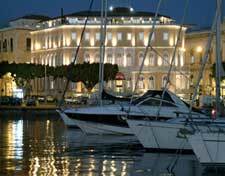 The hotel is situated on the island of Ortigia, from which it takes its name. The 4-Star Grand Hotel Ortigia is located in the old town, but within easy walking distance of the new city and 50 meters from the Marina di Siracusa, where it is possible to board boats for organized sea tours, and for the hotel's private beach, Punta del Pero, open from June to September.